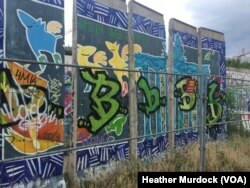 In 1989 Germans tore down the wall that divided Berlin and symbolized deeper global divides. Today, parts of the Berlin Wall still stand as a reminder of dark days in Europe. And after last week’s vote in the U.K. to leave the European Union, some young people wonder if Europe is taking a step back. Much of the wall is painted, with artists displaying everything from the horrors of suffering to unity, June 30, 2016. People both for and against Brexit have called the vote a “Berlin Wall” moment, given its significance. The former say the fall of the wall, like Brexit, represents freedom from tyranny. The latter says it began the era of globalization, but Brexit begins the era of tearing down the political bonds that have kept Europe safe and prosperous. 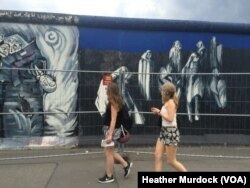 As she wanders through the park on the west side of the remnants of the Berlin Wall, now covered in artwork on both sides, Jess Korzenyowska, 22, said she is traveling across Europe on a EU-wide train pass, a trip that may not be possible if, as a U.K. citizen, she needs to get a visa for the continent in the future. Remnants of the Berlin Wall remain in the city, serving as a reminder of dark days in Europe, June 30, 2016. Younger voters in the U.K. were less likely to vote to leave the union, but young people here are not uniformly against the move. As he wandered along a section of the wall that displays a photo gallery depicting tragedies from modern wars, he added that he doesn’t like that the vote was driven by fear of immigration. One thing is for sure, if or when the U.K. leaves the EU, it will erect new logistical and economic barriers, and no one knows how divisive they will be, adds Domenico Manfredelli, a young Italian man who used to work as a bartender in the U.K. The wall is currently displaying a gallery of pictures and stories about modern war victims, June 30, 2016. “For me, London was a symbol of the unification where you can meet people from everywhere in the world. It’s a very weird situation,” he said. Others say they believe Europe’s security and prosperity in recent decades is related to European unity, as political parties in other countries discuss leaving the EU. It’s hard to say exactly what drives history, adds Kiri, from Finland.However there is little doubt in his mind that history has been made. “It’s definitely going to be looked on 20 years from now: Before Brexit and after Brexit,” he said.